New Drogheda convent a 'thanks' for the service Irish nuns in USA. The arrival of the first four members of the Franciscan Sisters of the Renewal in Drogheda has been described by Cardinal Timothy Dolan of New York as his way of returning his thanks to the people of Drogheda for the great work and service of the Sisters of Mercy in his native Diocese of St Louis. He was speaking on the Feast of the Assumption in Drogheda where he presided at a Mass in St Mary’s Parish to inaugurate the mission of the four New York Sisters. Cardinal Dolan was informed by Bishop Michael Smith when the Sisters of Mercy made the decision to leave St Mary’s parish having served there since 1854. The Cardinal, who was educated by Irish Sisters of Mercy in Ballwin in Missouri, then requested the new religious community – the Franciscan Sisters of the Renewal – to make their home in St Mary’s. The Sisters who have come to Ireland are Sr Jacinta Pollard, Sr Monica Ward, Sr Veronica Cowan and Sr Kelly Francis. 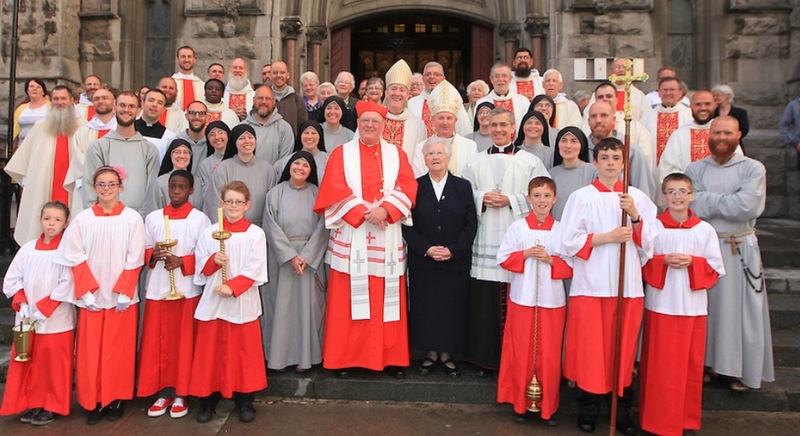 On Thursday, Cardinal Dolan presided at the Mass and was joined by Bishop Michael Smith, who acted as the main celebrant, as well as Bishop Denis Nulty, who was recently ordained Bishop of Kildare and Leighlin. Bishop Nulty served until last month as parish priest of St Mary’s in Drogheda and paved the way for the establishment of the new convent. 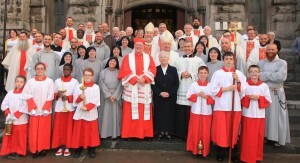 This was his first return visit to Drogheda since his Episcopal Ordination in Carlow on 4 August 2013. Earlier this month, four members of the Franciscan Sisters of the Renewal left their convent in the Bronx in New York to come and set up this missionary outreach in Meath. In his homily, Bishop Michael Smith recalled the association of the parish with the Mercy Sisters and paid tribute to their work and mission. “They will seek to touch the poverty within, the inner needs of the human heart, with the compassion of Christ,” he said.